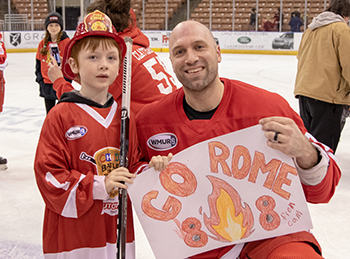 On Saturday, March 16, Team Fire snapped a three-game losing streak in dramatic fashion, scoring the game-winning goal with 5.6 seconds left on the clock in the 2019 CHaD Battle of the Badges Hockey Championship presented by AutoFair. The thrilling back-and-forth affair was only part of an awesome night that raised $278,000 for kids and programs at Children’s Hospital at Dartmouth-Hitchcock (CHaD). The 12th edition of this fundraising grudge match featured police officers and firefighters meeting on the ice at SNHU Arena, completing a six-month journey that began last fall with the initial team tryouts. Once teams were selected, the players began practicing together while working to raise at least $1,500 to play in the game. Team Police led the way with over $116,000 raised as a team, a new game record. That total was highlighted by the stunning amount generated by Kyle Daly of the Manchester Police Department—an individual record of $33,405. Rochester’s Keith MacKenzie, the only player to skate in all 12 games, raised over $9,000 for the men in blue. Team Fire raised a collective $62,751 for CHaD kids, led by last year’s top fundraiser Michael Snide. The Claremont firefighter raised over $11,000, followed by Concord’s Ian Gill ($6,660) and Conway’s Garrett Meador ($4,363). The action on the ice gave nearly 5,500 fans an amazing Saturday night show. Team Fire jumped to an early lead, 2-0, before Police rallied to tie it on a pair of goals by Alex Turgeon (Rochester PD). From there, it was back and forth until late in the third period. That’s when another Rochester representative, this time firefighter Micah Ruel, knocked a loose puck by Ricky Gaudreau (Conway PD) to put Fire on top, 6-5. Ruel’s goal gave Fire its first win since 2015, ending the longest winning streak by one team in this series. All time, Police still lead 7-4. Ruel was named co-First Star with Fire goalie Stephen Belle-Isle. Ruel finished with the game-winner and an assist while Belle-Isle teamed with first period Fire goalie Jeremy Bonan (Plymouth) to stop 58 of Team Police’s 63 shots. Jeff Clattenburg (Lebanon Fire) was the third star with a goal and two assists. Several other players finished with multiple points, including former Manchester Monarch Ashton Rome (Hampstead; 1 G, 1 A) and Matt McGilvray (1 G, 1 A) of Team Fire, and Turgeon (2 G) and Phil Arnone (Chichester; 2 assists) of Police. Beyond the players and fans, CHaD is grateful for the support from the companies and donors who make this game a success. Dozens of partners provided key support for the game’s fundraising, including our generous presenting partner, AutoFair, and our team partners Heilind & 3M (Team Police) and Bank of America (Team Fire). Approximately 100 volunteers donated their time to provide a warm and friendly face – and a helping hand—to fans attending the game. The staff at SNHU Arena and Savor…, the arena concessionaire, were at their typical all-star level throughout the day. Without the support of Tim Bechert and the arena, our skaters would be outside on a frog pond! 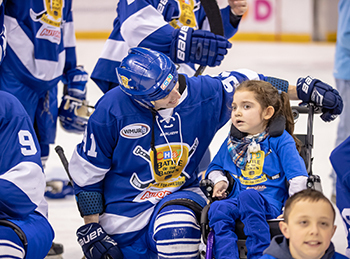 Check out the Battle of the Badges Facebook page to enjoy the photos and memories from this year’s game thanks to our photographers Rich and Rich from NH Sports Photography.